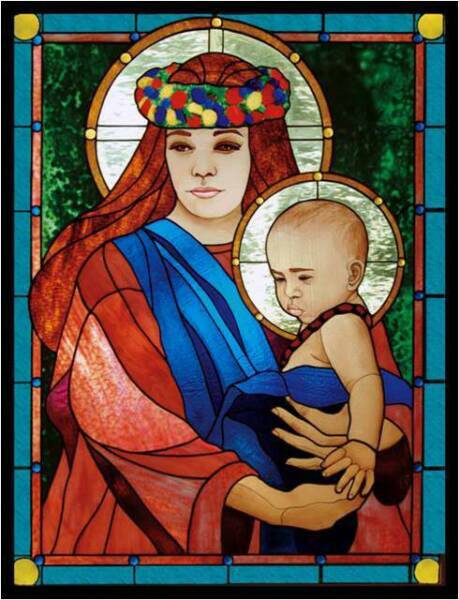 The Madonna and Child, 2003 (3 ½’ X 3’) stained glass windows with hand painted fired details Annunciation Church, Waimea, Hawai’i. One of the most popular and beloved images painted and sculpted in the Christian world is the Madonna and Child. In Italian, Madonna means ‘my lady’. In art, this refers specifically to a painting, window, drawing, or sculpture that shows Mary holding the infant Jesus as the central focus. Throughout time and place, renowned artists the world over have depicted the Madonna and Child. Among the most famous artists are Leonardo da Vinci, Michelangelo, Giovanni Bellini, Caravaggio and Rubens. The tradition continues, with contemporary masters such as Salvador Dali and Henry Moore. This window depicts a Hawaiian Mother Mary and her baby in order to connect with the local people of the island.